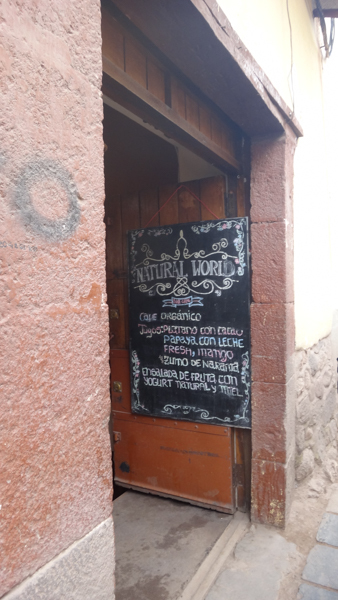 Tucked away on the one-way cobbled portion of the Recoleta street is an unassuming little place called Natural World (or “Mundo Natural”, though the sign itself is in English). Here the proprietor, Armando, serves up delicious home-made yoghurt in generous portions atop a bowl of fresh fruit salad; a welcome break from the more traditional and heavy Peruvian breakfasts of soups and meat dishes. He takes great pride in his yoghurt – and he has every right to, it’s probably some of the best yoghurt I’ve ever had, and I am a yoghurt-and-fruit-for-breakfast kind of girl. He cuts up the fruit fresh when you order it so if there’s a particular fruit you don’t like, you can ask him not to include it (I, for instance, don’t love papaya, so on my second visit I asked if we could skip it, so he offered me apple instead – along with bananas and strawberries). 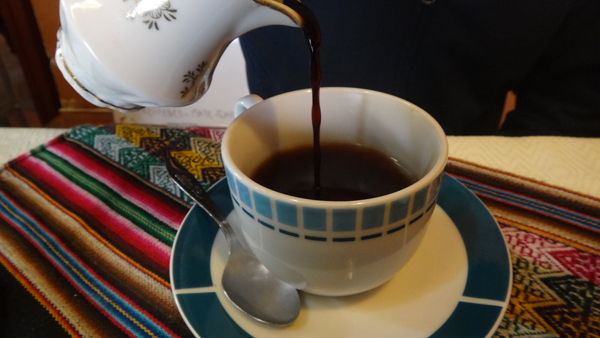 While it’s fairly common for us in Vancouver to have a healthy breakfast of yoghurt and fresh fruit, we’ve found it particularly difficult to obtain in both Ecuador and Peru. Most of the yoghurt available is drinking yoghurt, and it’s filled with sugar. Armando’s is made fresh, has no preservatives and is sugar free (he’ll put some honey or jam in for you if you like) and I’ve been pleased to find it’s quite filling – that huge bowl keeps me sated for hours, which when you’re on a budget is a good thing. 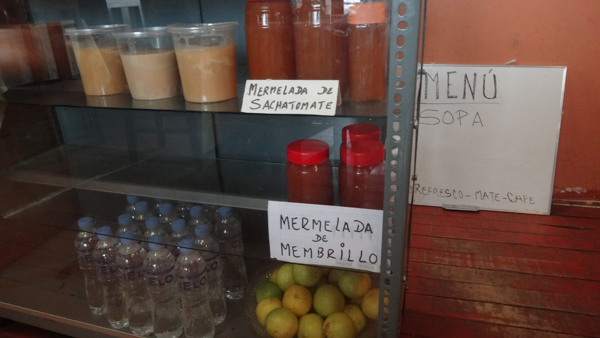 His tienda is attached to his home, so when you head to the counter to place your order he appears from his living room, excited to share his creations with you, often offering you a sample of his homemade jams and marmelades. All of them are his own special recipes – he shared with me one that was absolutely delicious made from something they call “sachatomate” (tree tomato) and told me that he’s perfected the recipe with a bit of grapefruit and papaya – it was so good I asked him to put it on my yoghurt instead of honey. He doesn’t speak much English, but the language of food is pretty universal and the big chalkboard sign at the entrance makes mention of the fresh, organic juices (jugos) and coffee, as well as what I think is his house specialty, the yoghourt with fruit salad (ensalada de frutas con yogurt natural y miel) – which will set you back a ridiculously reasonable 4.5 soles (approximately $1.25USD). There’s a lot he offers that isn’t on any particular menu – I looked over my shoulder to see someone eating an avocado sandwich, and someone else eating the more traditional breakfast of soup. In the corner there’s a giant stone, wood-burning oven that’s been painted to look like a polka-dotted mushroom! He says he offers different daily specials for lunch, though we’ve only come by for breakfast. Armando himself is a very kind, sweet man with a warm smile who is very welcoming and eager to ensure you’re enjoying your meal. He has a visible spring in his step when he rushes off to get you a cup of coffee or even a bit of jam. When Jordan asked if there was by any chance granola to put on top of the yoghurt, he offered to run out and buy some! (We of course said that wasn’t necessary, but were amazed that he was so quick to offer to buy that just for us). The coffee is also something unique – he serves you a mug of hot water and a little jar filled with approximately 2 ounces of espresso – you then pour the coffee in and make your own Americano to your taste (if you don’t like it strong, just pour less espresso in). 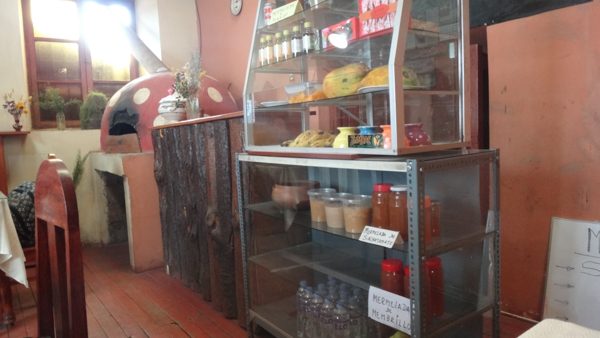 Armando’s place was a highlight in Cusco for me as I always crave a healthy breakfast to start my day, and they’ve been hard to find, even more so for so cheap (in the Plaza you could get something similar but nowhere near as big a portion or as delcious for around 12 soles). 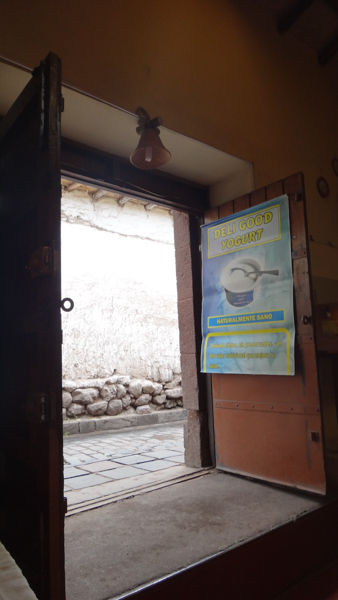 I only wish I had discovered his little shop sooner since we only stumbled upon it 2 days before leaving Cusco. I imagine any other travelers who are used to a lighter, healthier breakfast would love to stop here to start their day off. You can find Armando’s “Natural World” at 612 Calle Recoleta – though if you blink you might miss it, since it doesn’t have much in the way of signage except the chalkboard sign that hangs on one of the welcoming open doors.